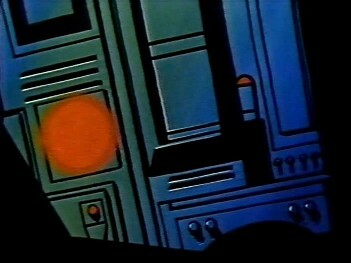 As seen in the mid-1970's animated POTA series "Return to the Planet of the Apes." 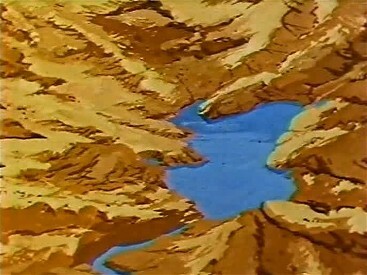 A video of the intro to this series including the crash scene can be found here. 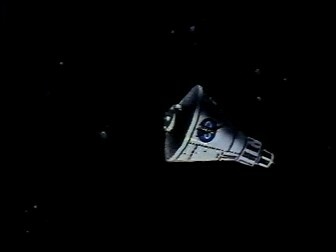 The NASA logo is clearly visible on the side of the "Venturer" as the first episode opens. This ship and its crew are clearly not members of the more familiar ANSA program. Fade out as we see the whole spacecraft. 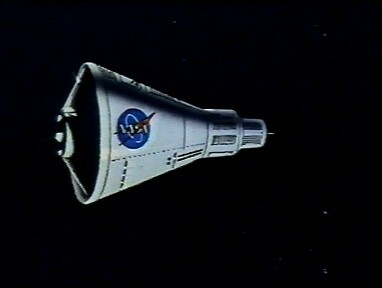 Notice it is almost identical to a Mercury space capsule, only much, much larger. The original Mercury capsule was a single person spacecraft and the fit was very tight. This spacecraft sits three across in much more comfort. NASA astronauts (L-R) Jeff Allen, Judy Franklin, and Bill Hudson (commander). Even though the "Venturer" looks like a Mercury space capsule, it can seat three astronauts comfortably side by side for long missions, similar to the Apollo space capsule. 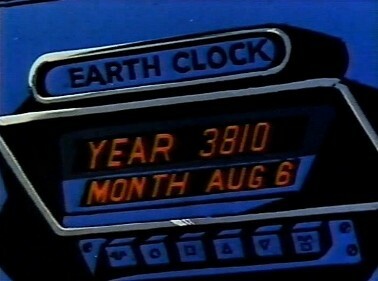 The self clock or ship time clock shows the subjective date to be August 6, 1976 AD. The Earth clock, reading objective time, is very much different. 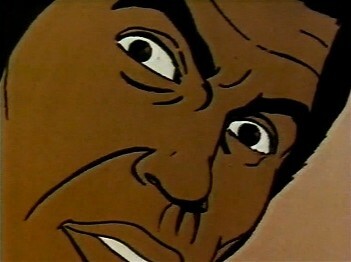 goes out of control, pitching nose down. in time but stays within the same month and day. 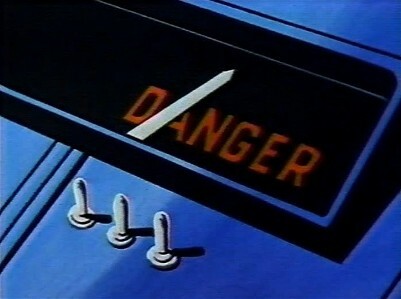 A red warning light goes off on the control panel to alert the crew of the danger. 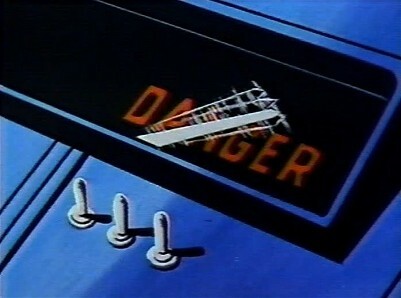 Ah, the patented NASA DANGEROMETER(tm). Yeah, it works just fine. Look at the instruments ! This is obviously not part of the flight plan. 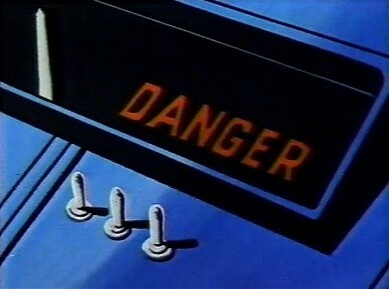 The "Venturer" moves ahead in time, out of control. 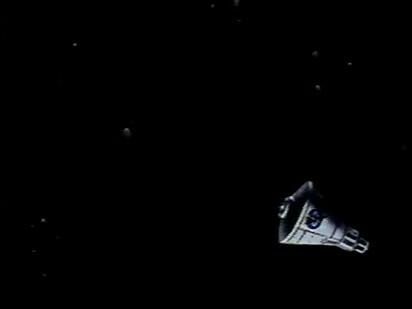 The astronauts have no control of the vessel. 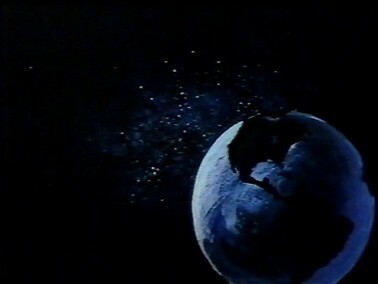 Future Earth. Much closer now. Is that the good old USA down there? The "Venturer" makes reentry and heads right for a shallow inland lake. Splashdown! 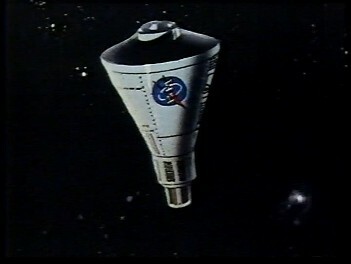 No parachutes and no thrusters which implies that this ship also has a working gravity drive. 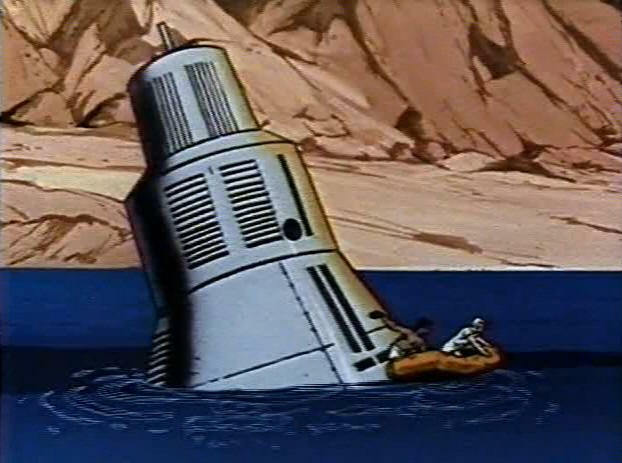 A collage of screen captures showing the crew of the "Venturer" after they abandon the spacecraft using a rubber life raft and paddle to shore. 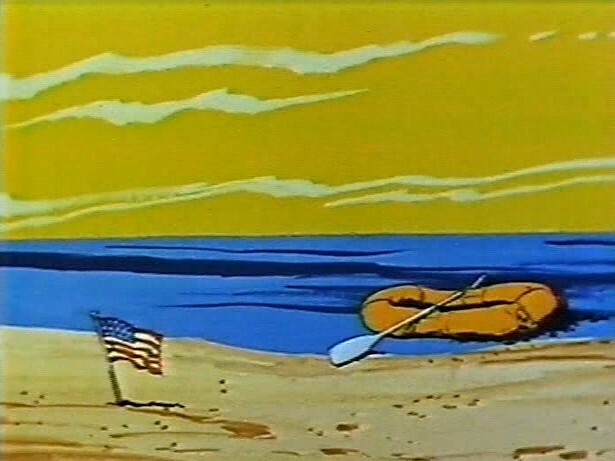 Fade out to the crew leaving a rubber life raft on the shore of a rocky beach and a small American flag, just like Landon did. 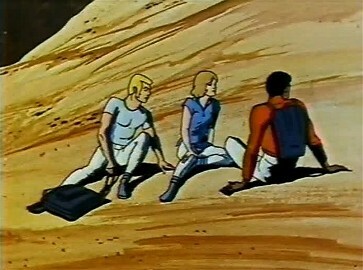 ... as the three astronauts rest and contemplate their fate. 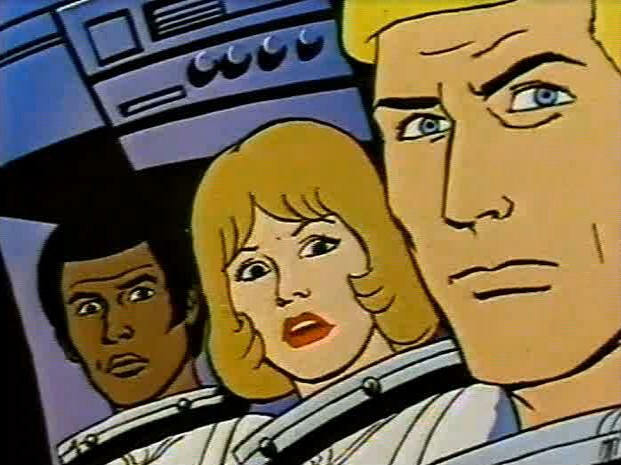 The three astronauts prepare to trek across the unknown desert. Bill Hudson has wisely chosen to wear a loose fitting white T-shirt for comfort. Judy Franklin comes in second with a blue short sleeve, loose fitting button up blouse. 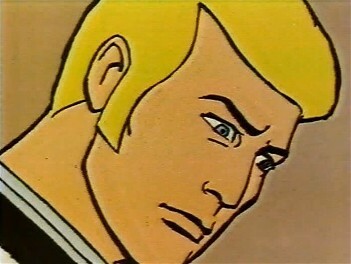 Jeff Allen is voted as the fashion and survivalist loser of the group as he decides to walk across a blazing hot desert in what amounts to a long sleeve red pull-over turtle neck. Whew! You know that's going to be hot! Did you pick up on the red, white, and blue patriotic motif? Good. I thought it was rather evident myself. 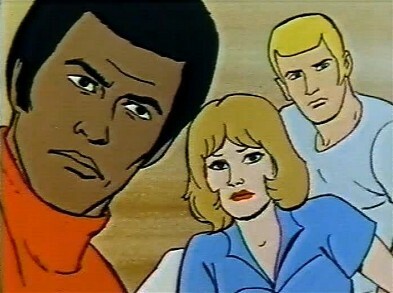 I wonder if Hudson and Franklin know that "Jeff Allen" is really O. J. Simpson in disguise? 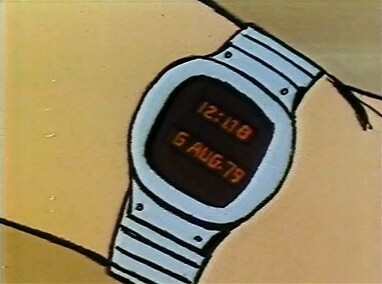 Bill Hudson checks his wrist chronometer, 12:08 on 6 AUG 79 meaning that they are eight minutes late for lunch. Of course, it is really a little after twelve noon over a thousand years into their future, so their lunch is probably a little cold by now. 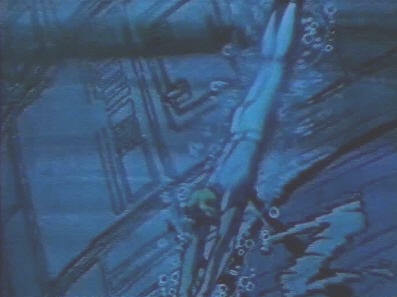 Later in the series, Bill and Jeff have to return to the sunken Venturer to retrieve some gear and to destroy the craft for good since it cannot be discovered by the gorillas. 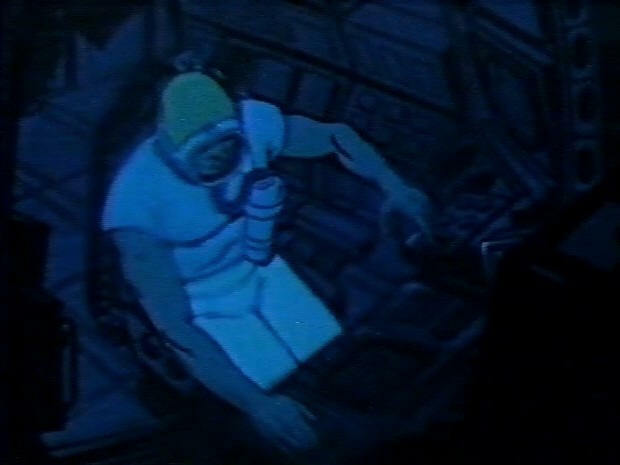 He dives down to the sunken spacecraft and retrieves a oxygen mask and air tank. You can see part of the NASA logo to the lower right of the picture above which should further give you an indication of the size of the spacecraft. 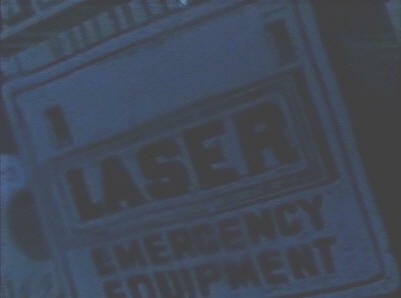 Bill then goes on to retrieve a portable laser drill that doubles nicely as a uber-powerful weapon able to melt its way through mountains. The size of the two astronauts gives you some idea of the size of this spacecraft. The "Venturer" floats in the lake as Jeff Allen and Bill Hudson prepare to salvage some much needed equipment from the ship. They are on a tight schedule as the gorilla soldiers are on their way to capture the astronauts and seize the spacecraft. If the gorillas find evidence of an advanced form of man (i.e. "astronaut") then they will begin to eliminate mankind as a threat. 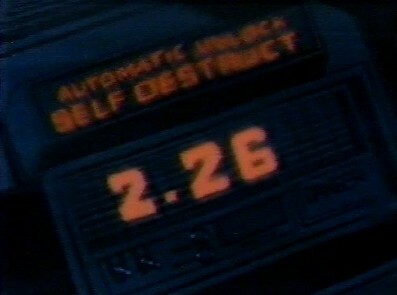 Jeff and Bill realize that they must destroy any trace of their spacecraft in order to prevent this. To complicate matters, a giant eel-like sea monster shows up to terrorize Bill during his dive. With the gorilla army closing in with jeeps, recoilless rifles, artillery and automatic weapons, the astronauts will have little chance to survive the encounter. 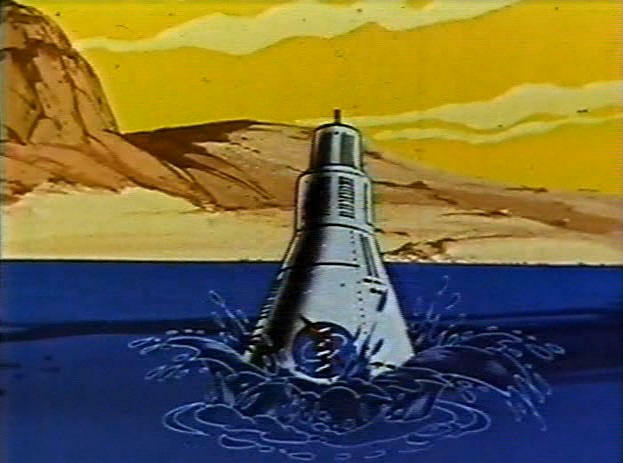 Bill manages to elude and trap the giant sea monster long enough to get aboard the "Venturer", set the self-destruct and retrieve the laser drill. With the destruction of the "Venturer" our crew is stranded forever in the future. What will they find? 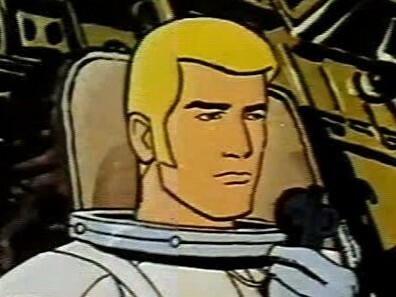 Well, they discover another stranded astronaut, Ronald Brent. Brent was launched much later from Earth than the "Venturer" and its crew yet arrived decades earlier than they did. You can find his strange 21st century spacecraft here.